Many Provo professionals, students and retirees are enjoying the lasting benefits of aesthetic dentistry. A beautiful smile not only looks great, it makes you feel great! When you first look in the mirror in the morning while brushing those gleaming babies, you remember; oh yeah, I fixed my teeth and they look fantastic! We have talked about different restorative and cosmetic dental procedures available in Provo in previous blog articles, but let’s review the most common. Dental crowns correct more extensive tooth problems. They are used in a variety of situations such as the final restoration following a root canal or to restore teeth damaged by decay, injury or periodontal disease. Dental implants are one of the best fixes for a missing tooth. They are becoming a popular and effective alternative to bridges and partial dentures in Provo, Orem and the surrounding areas – especially among middle-aged professionals and people in the public eye. Professional tooth whitening in your Provo dentist’s office is the least invasive and quickest way to brighten your smile several shades. One of the most popular systems is called Zoom! whitening. If you are interested in any of these safe and effective procedures, schedule a consultation at Hammond Aesthetic & General Dentistry today. Even if you are still a bit hesitant, remember: discussing your options with a cosmetic dentist does not require a commitment of any kind. It is merely a relaxed way to get the most reliable information. We are waiting for your call. 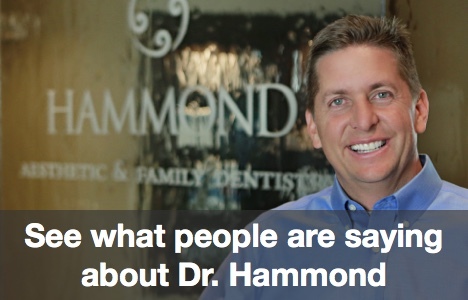 Hammond Aesthetic & General Dentistry can be reached at 801-374-0070.